Men sit on top of rubble after an earthquake hit the southern coast of Peru on August 15. Luis Encinas, a Doctors Without Borders/Médecins Sans Frontières (MSF) emergency coordinator, is managing the intervention to provide care to those affected by the earthquake that hit Peru's southern coast on August 15. Three days after the disaster, MSF chartered a cargo plane, loaded it with 12 tons of relief materials, and flew into Peru. Encinas, who has been on the ground for a few days, gives an account of MSF activities. What were your first impressions when you arrived in the affected area? 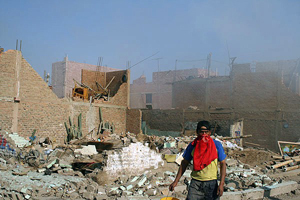 In Pisco, at first it felt like I was witnessing a bombed area. People were wandering about in the streets in a state of confusion, of loss. There was no access to basic services. 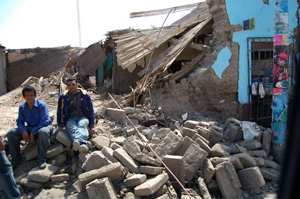 In the most affected areas, like the towns of Pisco, Chincha, and Ica, between 50 and 90 percent of the buildings have been destroyed. Four hospitals have been reduced to rubble and another four were severely damaged. So far, about 400 aftershocks have been recorded; some of them have reached over 5.5 on the Richter scale. What difficulties has MSF encountered while delivering humanitarian aid? Access ways have been badly damaged. For example, some parts of the Pan-American Highway have virtually collapsed. Reaching Pisco from Lima took us three times longer than normal. Although the chaos situation is fading away, humanitarian aid has not reached peripheral areas yet. Now that MSF has flown in 12 tons of relief materials, what is the planned intervention? An MSF worker assesses the needs of the local population in Pisco, Peru, following an earthquake that measured 8.0 on the Richter scale. After the first assessments have been conducted in the area, the intervention focuses on the most isolated settlements where humanitarian aid has not arrived yet. Medical care and psychological support will be provided to the earthquake victims. The area where the MSF team is providing care is located east from Pisco town, along the route between Humay and Independencia (where from 20,000 to 25,000 people live). So far, we are distributing blankets, hygiene kits, and shelter materials for 7,000 people in Humay. We are also assessing water and sanitation facilities to be able to provide rapid response if needed. No other humanitarian aid providers have arrived there yet. Medical supplies and drugs are lacking. Another important issue is directly linked to mental health. In order to reduce trauma and respond to the most urgent psychological needs, MSF is launching a mental health program. Medical care and psychological support will be provided in the existing health centers and through mobile clinics. Drugs for respiratory infections, skin diseases, and trauma are also being provided. In Pisco town, MSF is focusing on offering psychological care to the people affected by the havoc resulting from the earthquake, and we will also collaborate with local providers on water and sanitation tasks. What major risks does the population face now? As it usually happens in these types of disasters, children are the most vulnerable population group. Respiratory infections affect them severely. The rapid assessment conducted in Montesierpe, a community close to Humay, revealed that about 15 percent of children with respiratory infections showed severe complications. There is also a risk of severe conditions such as trauma, skin diseases, and ophthalmologic infections. Another problem has to do with the consequences for mental health for which a rapid response immediately after the emergency can be crucial in preventing severe damages in the long term. After having participated in other emergency interventions, what strikes you as distinct about this one? More than 500 people were killed and at least 1,000 injured due to a powerful earthquake that hit the southern coast of Peru. From a human perspective, the strong, deeply rooted community spirit amongst the population in the area has amazed me the most. I have seen people older than 70 who spent the night in the open keeping watch in shifts to protect one another. They have nothing. They have lost everything but the capacity for lending a helping hand. In the midst of widespread havoc, the way the affected people spontaneously organize themselves is impressive. How many people make up the intervention team you are coordinating? So far, the intervention team is made up of 12 international volunteers and 12 members of the national staff, including doctors, psychologists, nurses, logisticians, water and sanitation technicians, and drivers. We estimate that the intervention will last two months.